There’s a reason we became interested in the Raptor Alloy Hooks. Well, to be honest there’s quite a few reasons. But at the forefront was the prospect of discovering a hook that could enhance the performance of a lure. … And that’s exactly what these hooks do. Raptor Alloys are manufactured by Kiwi Blue in New Zealand. They are a premium hook constructed of a unique aircraft grade alloy containing titanium, making them 30% lighter than steel and approximately five times the strength. Director of Crazy Fish Imports, Stu Cameron, can’t hide his enthusiasm. 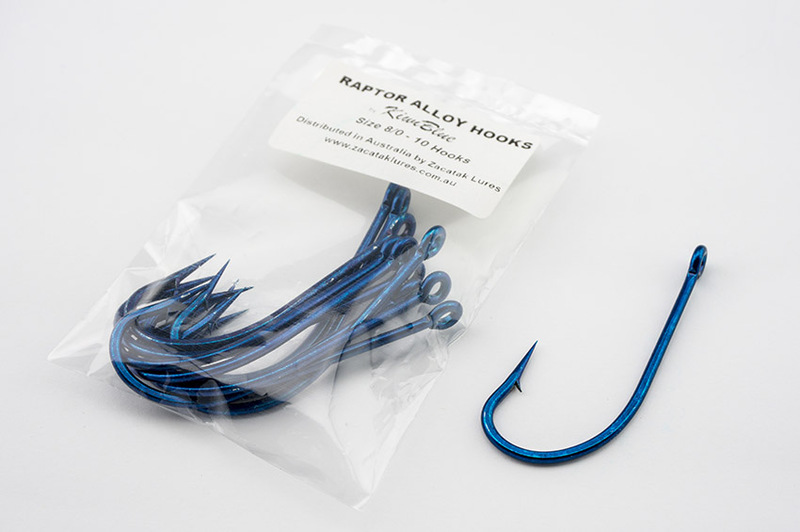 Raptor Alloys are suitable for all size lures and line classes. The light weight of the Raptor Alloys is perfect for gaining the maximum performance from your lures. Their strength allows the hooks to be used on fish many times larger than their size would otherwise dictate. The combination of fine diameter and high strength point mean good penetration even at low drags, which really make a huge difference! The hooks also feature a blue coating that is virtually invisible in oceanic water. “On many occasions I’ve pulled a lure in and freaked thinking I’ve lost the hook, only to lift the lure from the water and realise the hook is actually there!” says Stu. Sydney based angler, Brett “Changa” Chain tested the Raptor Alloys during a trip off Port Stephens. Raptor Alloys also have extraordinary corrosion resistance. The end result – a hook that is almost indestructible! Raptor Alloys by Kiwi Blue are an O’Shaughnessy pattern in size 8/0. They have a gape of 25mm and an overall length of 70mm. You can pick up a pack of ten for $49.50 plus postage by clicking here. Zacatak Lures is proud to be the exclusive distributor of Kiwi Blue Hooks within Australia. If you have a wholesale enquiry, please click here.